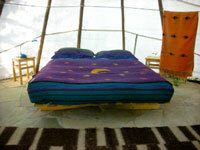 It is a sweet location, near the edge of the forest. To one side its neighbors are tall cedar trees, on the other side it offers a filtered view of an open field. 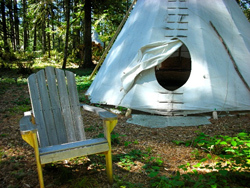 The Sacagawea Tipi is one of the two forest tipis we added to our collection in the spring of 2009. 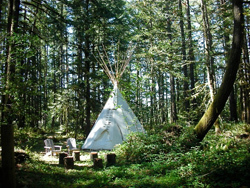 There are now three forest tipis, all connected by trails and within sight of each other, but with plenty of privacy space in between. 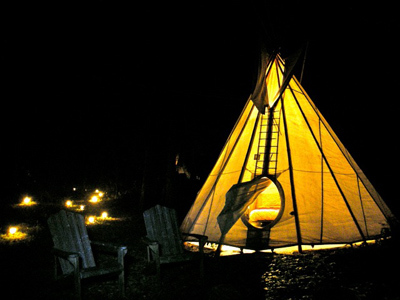 The interior of this tipi features a stone floor with wool rugs and a queen size bed - so comfortable, you might want to stay in bed and enjoy a morning of listening to the birds - or open the door and watching the deer, the wild turkeys or the flock of quail wandering by. 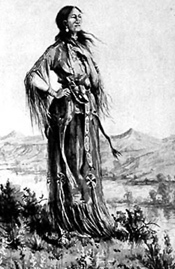 Much about Sacagawea, the only woman on the Lewis and Clark expedition into the American West, is a mystery. Daughter of a Shoshone chief, born around 1788. At the age of 12, Sacagawea was captured by Hidatsa Indians, an enemy of the Shoshones. She was then sold to a French-Canadian trapper named Toussaint Charbonneau who made her one of his wives. Sacagawea and her husband lived among the Hidatsa and Mandan Indians in the upper Missouri River area (present-day North Dakota). 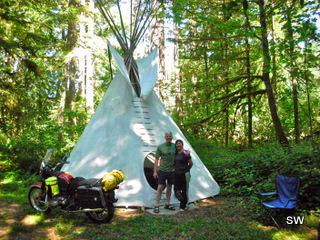 Lewis and Clark met Charbonneau and hired him to serve as interpreter on their expedition. Even though she was pregnant with her first child, Sacagawea was chosen to accompany them on their mission. Lewis and Clark believed that her knowledge of the Shoshone language would help them later on their journey. In February 1805, Sacagawea gave birth to a son named Jean Baptiste Charbonneau. Despite traveling with a newborn child during the trek, Sacagawea proved to be helpful in many ways. She was skilled at finding edible plants. She also served as a symbol of peace — a group traveling with a woman and a child were treated with less suspicion than a group of men alone. “You must speak straight so that your words may go as sunlight into our hearts."